The atmosphere here in Auckland this week is peculiar. The City should be bubbling - New Zealand are in the final of the World Cup and are odds on favourites to bring home the Webb Ellis Cup after 20 years of torment. Instead it is as flat as a pancake. Part of it is the calm before the storm but part of it is that New Zealanders are furious. Somebody - Alain Rolland - has rained on their parade. By sending-off Sam Warburton he has taken the gloss off the whole tournament. New Zealand were inexorably marching towards fulfilling their destiny but now Rugby World Cup 2011 will forever be remembered for Rolland ruining a key match thereby taking out perhaps the only country that could have really tested the All Blacks. The reaction from ex-All Black skipper, Buck Shelford, sums up the sadness and frustration felt by most rugby fans on this side of the world. "The bad thing was that judgement was made so quickly, without a second to consider what had happened truly, without any consultation with fellow officials or a proper look at the incident which technology could have provided. A yellow card would have been the right response," he said. "If I have one sadness it is that Wales will not be involved in what would have been a great final…..even with 14 men they should have beaten the French but with a full team they would have done it by 20 points." The French feel terrible - they know it was not their fault but they do not believe they should be in the final. I just hope the team do not feel the same. 2. If a lifted player is dropped to the ground from a height with no regard for the player's safety - red card. 3. For all other types of dangerous lifting tackle it may be considered a penalty or yellow card is sufficient. Surely, option 3 was the right one in this case - he was lifted and dropped but from no height and it was obvious he was trying to release the player immediately to try to win the ball - something that he had done so effectively he was a candidate for 'Player of the Tournament' until that moment. Everybody knows he is not a dirty player and that there was no intent. There had also been several other similar tackles earlier in the tournament that had not been punished with a red card. I am the first to condemn deliberate foul play but you cannot always control exactly what happens in a tackle - it is not an exact science. It was also interesting to talk to one of the other World Cup referees immediately afterwards. I shall not name him because it could land him in trouble with his bosses but Brian Moore can confirm that he said he would not have issued a red card - so much for 'no choice.' Should Rolland have taken into account the occasion and the catastrophic effect his decision was bound to have on the game? I do not believe you should referee differently because it happens to be a hugely important match but I do believe you have to take a deep breath and give yourself every opportunity to review the evidence and make sure you have it absolutely right. Rolland could have bought a little time by asking for the views (literally) of his assistant referees but, instead, the red card was out in a flash - to me that was as reckless as the tackle. O'Brien backed his man to the hilt, of course, and will point to the guilty verdict from the disciplinary hearing as vindication for his stance but why did they only hand out a three match ban when the starting point is supposed to be six weeks? Forget all the so-called mitigating circumstances - they did not believe it was a seriously dangerous tackle either! Post World Cup there will be a review of the laws and everything that goes with them. 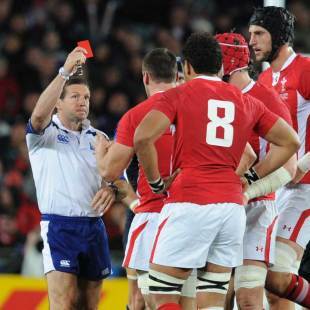 Because the impact of losing a man in rugby has such an effect on the course of the game I believe it is time to consider a yellow card linked to a report system with the red card reserved for deliberate foul play such as kicking or striking an opponent. That way the game is not ruined as a spectacle for millions of people around the world and an over zealous referee cannot singlehandedly change the course of a tournament as important as the World Cup.